In Luxury Residential Construction the use of multiple finished floors has long been a challenge where high performance soundproofing for floors is concerned. Compliance with building codes requires that the footstep blocking of all floors must perform the same; these standards are even higher when there are bedrooms below a living room, kitchen or dining room. Sound Isolation Company has designed a simple, effective floated floor system that will accommodate wood, tile, stone, vinyl plank and carpet floors, while exceeding the highest standards for IIC performance. Using Privacy Ultimate Underlay, as the decoupling layer below a new floated plywood sub floor, is the most economical, reliable and proven option for your project. This “Ultimate” floated floor will simplify your project, eliminate the need for lightweight concrete, and cut the installation time to one day. There is no other option that can provide all the benefits available with this system. We are available to assist with your design immediately. Our strength is finding the right soundproofing solution that will be compatible with your unique project; cookie cutter products cannot meet the luxury requirements you really want. Don’t settle for average results; it is easy to get remarkable soundproofing when you work with the right company. 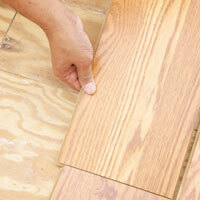 STEP 1: Insure that subfloor is smooth, clean and level. STEP 2: Install Perimeter Isolation Tape all the way around the room, and around any piping, conduits or other penetration in the floor. 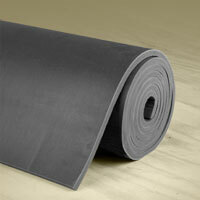 STEP 3: Install Privacy Ultimate Underlay™ loose laid to cover the complete subfloor. For wood joist floors, underlay needs to be perpendicular to joists. 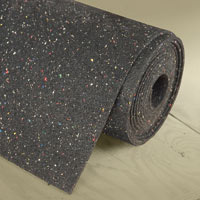 Insure that all underlay seams are tightly butted together, use Acoustical Sealant and Foil Tape to seal all seams. STEP 4: Install two layers of plywood directly on PRIVACY ULTIMATE UNDERLAY™ with perpendicular and staggered seams, glue and staple together. 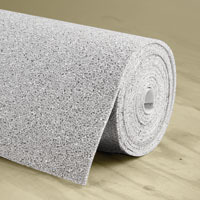 Do not use fasteners that will penetrate the underlay and make connection with original subfloor; gluing is an option if needed. Consult with factory on glue down methods. STEP 5: You now have a completely floated sub floor. Build partition walls on floated sub floor, install finished flooring of any kind.